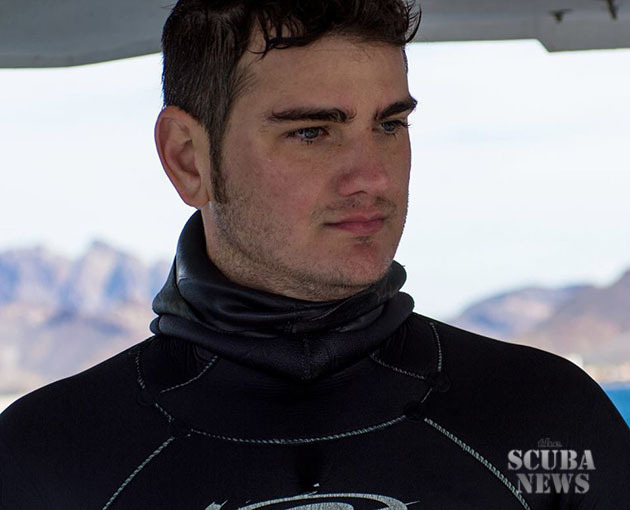 Say hello to today’s featured diver, Nick Fazah. Nick is a partner at East Coast Divers in Boston Massachusetts who started diving at age 13 and counts an encounter with a humpback whale as the most memorable dive of his life so far! Diver Qualifications: International Freediving Training Director for SSI. SSI Scuba Instructor Trainer. I started diving in the UK when I was 13 years old. I did my original cert dives at Stoney Cove in Leicester, UK. I was part of the British Army cadet force and they had an opportunity to learn to dive. I always loved being in the water, and jumped at the chance. I was working on the south coast of England at a kids adventure center when I got certified to teach snorkeling through BSAC. It was so much fun I knew I wanted to take it to the next step and teach diving to people around the world. My absolute favourite dive site would have to be the Patriot in the Stellwagon Bank in NE. It’s a great little wreck at 100′ that’s absolutely covered in fish and the last time I was diving on it I encountered a 40′ humpback whale in the water. I would have to say the humpback whale dive on the Patriot. I don’t think I will ever get to see a humpback in the waters of NE again at such a close range. If I do I will have to buy a lottery ticket that day just in case. I would definitely have to be a dolphin. They are so graceful and playful in the water and I’m envious of their freediving ability! I would have loved the chance to dive with Enzo Maiorca, Jacques Mayol or Bob Croft. Those guys were pioneers of freediving and pushed the limits when all else said they couldn’t! I still want to dive “The Arch” In Dahab mainly because it has such an epic history of people who have dove it. If I had to pick a second it would be the continental divide in Island. Tickets look like they’ll be cheap in 2015 so I’m hoping to knock that one off my list pretty soon. My favourite piece of gear has to be my Mares Carbon Razor Fins. They are so comfortable and for the price they are the best fin I’ve kicked! Plus, after 18 months of solid abuse they’re still holding up, which is pretty rare for my gear. I would help continue the fight against shark finning. Shark fin should be banned across the entire US and world. Such a barbaric and wasteful practice that is decimating one of the oceans most important apex predators. Hopefully the same thing I’m doing now, running my dive center in Boston and teaching freediving and scuba around the world!